Our recently re-engineered Counterbalance Drum Lifter is a popular product for use in narrow workspaces. The Counterbalance Drum Lifter design eliminates the need for outlying legs, enabling you to place drums in areas that would otherwise be difficult to access. The universal drum catch, which we use on all our drum lifting trolleys, allows you to safely move a variety of drums. This model comes with a safe working load (SWL) of 250kg, which we can increase to 350kg if required. Laser cut from stainless steel, the adjustable drum catch allows you to connect the unit to drums of different types, sizes and materials. For a breakdown of the drums that are compatible with this catch, view the drum suitability document below. With our stainless-steel ladder you can adjust the position of the drum catch to accommodate drums of different heights – just move the catch lower for shorter drums and higher for taller drums. For a detailed breakdown of the drum heights that are compatible with this product, please see the drum suitability feature below. Rear-wheel tiller steering provides a tight-turning circle, which is useful if you’re using the Counterbalance Drum Lifter in confined areas. The steering arrangement features a combined park brake to keep the drum lifter static when not in use. We assemble our hydraulic jacks by hand in our UK factory to ensure that each hydraulic system is clean and reliable. During the manufacturing process, our team of engineers tests and inspects every pump to make sure they’re working smoothly and effectively. To make sure this product performs well in all conditions, we use high-quality elasticated rubber wheels. We also use rubber-sealed (RS) precision bearings: these offer premium wheel performance in harsh environments. To get the most out of this unit we recommend using it on smooth surfaces. 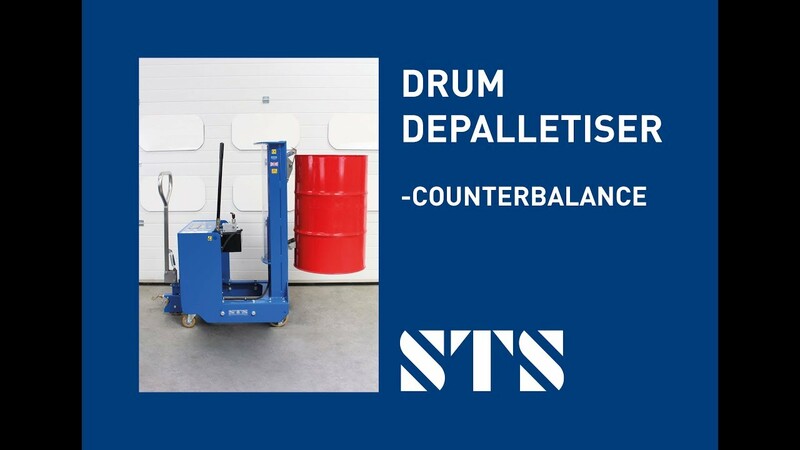 As with our other drum lifters, you can use the Counterbalance Drum Lifter with a wide variety of drum types and sizes, which is useful if you handle different types of drum on a daily basis. For details about the drums with which this product is compatible, please see the drum suitability document below. If the drums you use aren’t in the specification, contact us and we can offer advice and guidance. Explosive or potentially explosive atmospheres require operators to use zoned ATEX equipment. We provide fully-certified drum handlers for use in these hazardous areas. The DTP08-Ex Counterbalance Drum Lifting Trolley is suitable for use in ATEX classified spaces: Zone 1, 2, 21 and 22. Electrical continuity - whereby a path to ground is always present – is of key importance when manufacturing ATEX-compliant drum handling equipment. All our ATEX drum lifters are supplied with an EU Declaration of Conformity. We can supply you with an ATEX version of this model, suitable for use in ATEX Zone 1 environments and certified to ATEX Directive 2014/34/EU. We offer 304-grade stainless steel drum lifters, suitable for clean rooms as well as good manufacturing practice (GMP) areas. We can provide this unit with a taller lifting ram (up to 760mm lift stroke), allowing you to place drums onto high containment bunds. We can offer this model with an increased SWL of 350kg. The 350kg-SWL model functions in exactly the same way as the regular model but is simply 230mm longer. See the full technical specification for our Counterbalance Drum Lifter for details such as weight, dimensions and load capacity. View the instruction manual for our Counterbalance Drum Lifter, which details how to safely operate and maintain the unit.